This page tries to list all the significant new features of WinDVD 11 (as compared to WinDVD 2010) - the actual review of WinDVD is on the next page. 3D has been the focus of this latest WinDVD release, in an effort to catch-up to the 3D support offered by PowerDVD. 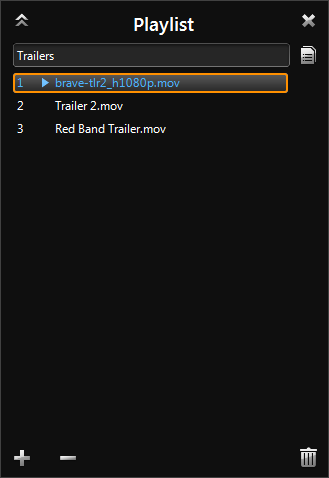 WinDVD 11 Pro now supports full Blu-ray 3D playback. 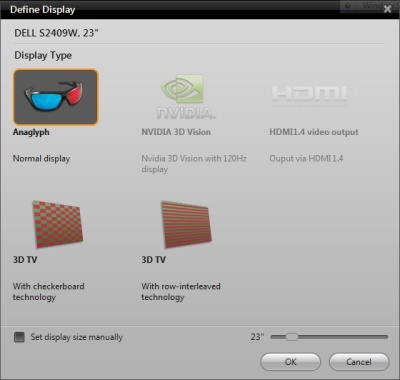 All the usual 3D modes, from the classic anaglyph glasses, to modern polarized ones, are supported, including support for NVIDIA 3D Vision. On top of Blu-ray 3D support, WinDVD 11 also supports 3D video recorded via Fujifilm® 3D cameras or any compatible 3D camera system. Those without 3D content, but have the 3D hardware can also benefit from WinDVD's 2D to 3D upconversion feature. 3D upconversion is available for SD/HD video files, as well as DVDs, but not Blu-ray discs. With the focus for home video now firmly on Blu-ray, Corel has not neglected DVD or video files in WinDVD 11. A couple of new visual enhancements have been added. 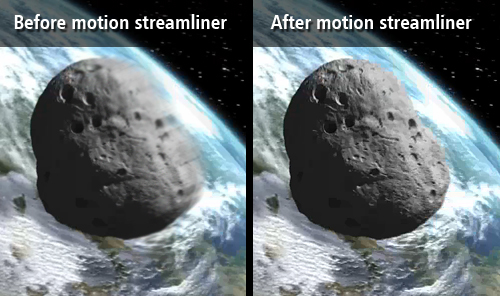 Motion Streamliner aims to make fast motion video appear sharper, while anti-shaking has been added to deal with home shot content. WinDVD 11 also now includes a more advanced playlist editor. WinDVD 11 adds full support for the BDXL format, the extension to the Blu-ray format that allows for 100GB+ discs (compatible reader drive required). And trying to make WinDVD into more of a fully fledged multimedia player, support for MKV, FLV and MP4 files have also been added. The WinDVD 11 interface has been further streamlined, and designed to be as lightweight and more responsive. The framelesss playback window removes clutter from the screen and allows you to concentrate on the video, even in windowed mode. 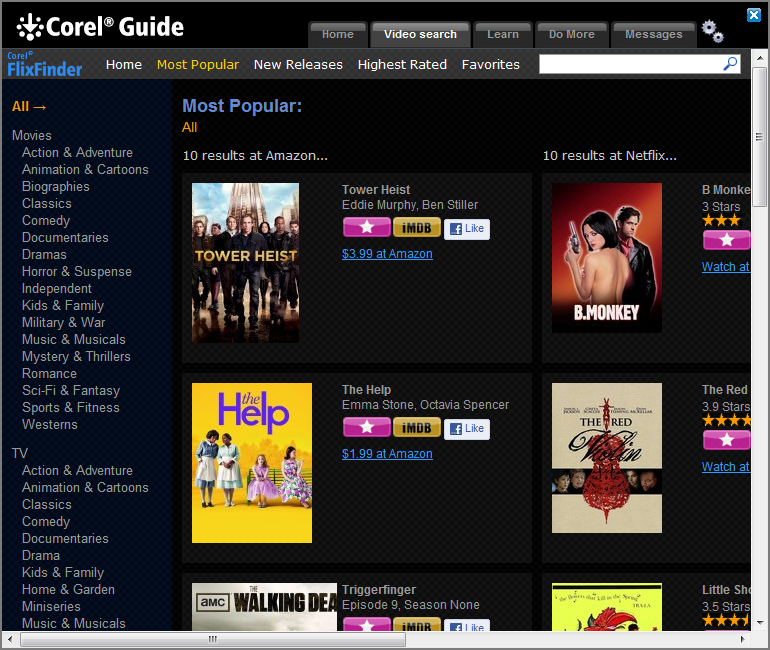 WinDVD 11 also integrates Corel's FlixFinder web service. 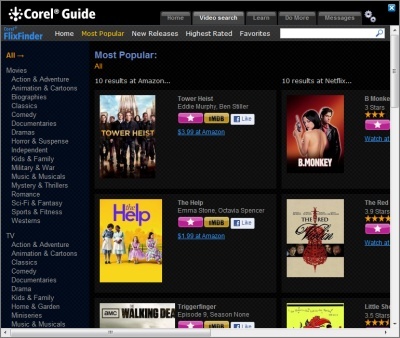 Click on the Corel Guide button at the top of the window essentially opens an embedded web browser that allows you to search for tip and hints on how to use WinDVD, as well as access FlixFinder, a service designed to help you find legal video content online.